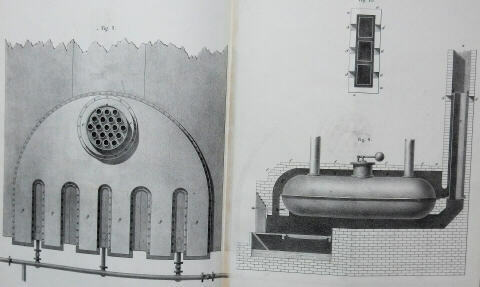 Extracts from Samuel Hall's specification of his patent of 24th, June, 1836, for improvements in propelling vessels, also improvements in steam engines, and in the method or methods of working some parts thereof, some of which improvements are applicable to other useful purposes. Throughout the 19th century there were constant attempts to reduce the amount of smoke produced in industrial areas, by legislation and also by improvements to boilers and furnaces. Samuel Hall took out a series of patents designed to increase combustion of fuel, which would thereby produce less smoke. His first such patent appeared in 1836 and the present rare item describes and illustrates the smoke-consuming apparatus covered by it. His system involved the introduction of heated air into the entrance of the boiler as well as above its fire bars and he shows how the concept can be applied both to marine engines and to locomotives. Other patents followed and his ideas seem to have been taken up quite extensively by the engineering world. 4to. 6pp, 4 fine double-page litho plates. Boards, orig. wrappers bound in.